Honestly my kids won’t be harmed by take out will they? I am planning a new meal –a combo of some Bobby Flay and some Barefoot Contessa for Wednesday…I may become a better cook and the cancer will be eradicated from any possible hiding place but what will happen with my cholesterol? Okay I will change some things–no heavy cream for one thing. More presents to buy and the tree to decorate and carols to sing. How about a picture? 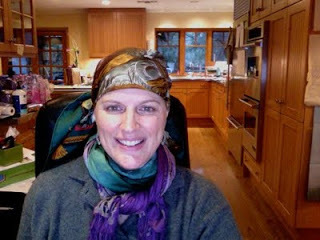 I am wearing all my scarves…Now I expected my head to be cold but plum forgot about the back of my neck!! !